Editor's Note: This article was originally published in July 2017 and has quickly become one of our most popular blogs to date. Because the topic is so timely we have chosen to republish it as this week's blog! As change management consultants, we’re often asked how Agile and change management fit together. There are a lot of questions about how adding change management to an Agile project management cycle works; there are concerns expressed about whether change management will slow things down, and get in the way of the speed and innovation derived from Agile. 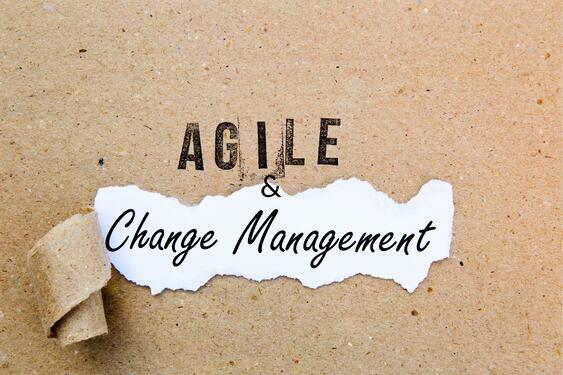 The need for change management is arguably increased in Agile because of its iterative nature, the amount of churn created, and consequently, its impact on climate and readiness. There are implications for change management when an organization adopts Agile that need to be addressed. What is the same in both approaches is the need to focus on full implementation, not just installation. What is the same is the fact that if you marry a fit for purpose, situational change management approach that’s blended with project management protocols, you will help projects be implemented faster and to benefit realization. Agile is a project management approach that works by breaking projects into short, iterative cycles called “sprints”. At its core, Agile is based on the assumption that circumstances change as a project develops. That’s why, in an Agile project, the planning, design, development, and testing cycles are never done. They continue to change as the project takes form. As with other project management disciplines, Agile project managers focus on doing things technically right by making certain they deliver business changes under time, cost, and quality (scope) constraints. That’s Installation. While you are still working through a life cycle, in Agile, they are doing this in short sprints, rather than saving it all for the end. This has the potential to create ongoing disruption and churn. Is the Definition of the Change still accurate, and are Sponsors and Agents aligned? Where will we have resistance, and how will we manage it? What do we need to communicate, when, and how? What reinforcements are needed to drive the change to sustained, full implementation? 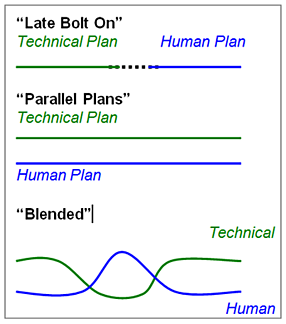 Whether you are using Agile or Waterfall life cycles, it is still best practice to blend the technical plan with the human side plan. In fact, because of the iterative nature of Agile, it is even more critical that you do this in order not to miss implications on the people side for technical project plan changes, and vice versa. The other common options (bolting on the human side at the end, or running parallel plans) don’t work. Instead, both the technical (aka project management) side and human (aka change management) side of implementation must be managed concurrently to achieve real project success: projects that are delivered on time, on budget, all business, technical, and human objectives met. The Accelerating Implementation Methodology (AIM) is ideally suited for an Agile world. AIM is a change management framework designed to be flexible based on what is occurring at the moment rather than what is next on the “to do” list. AIM’s core principles guide you on what you should be doing, given the day-to-day project realities and challenges. It is a risk dashboard for the people side of a change. Both Agile and AIM are based on the common assumption that change is not linear! In our vast experience working on business change implementations both small and large, we have yet to see a project follow the exact original plan. Most, if not all, implementations are dynamic and unpredictable. That’s why a process that is flexible, based on what is occurring at the moment, is so valuable. It’s one of the reasons Agile and AIM work so well together. In the end, it doesn’t matter if you are working in an Agile environment, or a more traditional Waterfall development process. The blend of a fit for purpose and repeatable change management process like AIM dramatically improves the likelihood of implementation success.